Note: The predecessor to this page, "Dyeing Acrylic With Basic Dyes", has been split into two different pages: the one you are currently viewing, which is "About Basic Dyes", and another page, "How to Dye Acrylic Yarn and Fabric". Basic dyes are dyes that are cationic. This means that the dye molecule has a positive charge, unlike most dyes, which have either a negative charge or no net electronic charge at all. The word "basic" refers to bases, as opposed to acids. It's definitely not basic in the sense of "back to basics". These are not dyes for beginners; they are not the most useful of textile dyes. Most dye molecules have a negative charge when dissolved in water. Dyes with negative charges include fiber reactive dyes, direct dyes, acid dyes, and most natural dyes. Some dyes are neutral in charge, neither positive nor negative; these dyes include vat dyes such as indigo, naphthol dyes, and sulfur dyes, which are similar to vat dyes. Only basic dyes have a positive molecular charge. The reason why this is important is that the positive charge makes basic dyes stick to almost anything. Working with basic dyes is a mess, because they stain just about everything they touch, even plastics and silicone sealants. Other types of dyes can be more easily scrubbed off of impervious materials such as plastic, glass, and porcelain. Their positive charge also attracts basic dyes to proteins and nucleic acids in your body, making them useful as biological stains, but more dangerous for your health. Basic dyes are historically important in that they include all of the first synthetic textile dyes, starting with mauve, which was the first synthetic dye. They are also of importance in medicine, due to their ability to bind to and stain different parts of human cells so they can be distinguished through a microscope. Basic dyes important for their use as biological stains include crystal violet, safranin, basic fuchsin, methylene blue, toluidine blue, and thionine. What fibers can be dyed with basic dye? Basic dyes can be used to dye many different fibers, including natural fibers such as wool, silk, and cotton, but, when used on natural fibers, they are very poorly lightfast: they tend to fade very quickly when exposed to light. Since the introduction of many superior dyes for natural fibers, basic dyes are no longer much used for dyeing them because of the lightfastness problem. However, basic dyes continue to be very important in the textile industry for dyeing acrylic fibers. Their lightfastness on acrylic fiber is far better than on natural fibers. Acrylic yarn and fabric cannot be dyed with most dyes that work on natural fibers; they can be dyed only with basic dyes or disperse dyes (the same disperse dyes that are used for acetate and polyester). Basic dyes are needed to produce bright or dark hues on acrylic fiber, because disperse dyes produce only pale to medium colors on acrylic. Basic dyes do not bind to cotton at all well unless the cotton has first been mordanted. A mordant forms a bond directly to the cotton; the basic dye then bonds to the mordant. Oddly, pre-dyeing with a direct dye can serve for mordanting on cotton. In dyeing reeds, raffia, grasses, and barks, these substances' natural tannin content acts as a mordant for basic dyes. Basic dyes are not a suitable choice for the beginning dyer, or any dyer who is not well versed in safety rules. I have found the very idea of basic dye to be unnerving ever since I used it to kill cells and break DNA for my doctoral dissertation research. This is not entirely fair, as not all dyes in the dye class are equally toxic. You should, however, be aware that anything that breaks DNA is probably also a mutagen and a carcinogen. You MUST obtain the MSDS information for every basic dye that you buy, and follow the safety precautions with great care. If your dye supplier does not provide MSDS information, find another supplier! Do not patronize companies that are willing to disregard your health and safety. Buy dyes in liquid or paste form when possible; mix powders inside glove box, hood, or wear respirator; wear gloves; install canopy hood over dye bath. A glove box may be constructed from lucite panels, glued together, with holes to which heavy gloves have been attached, so that you can reach in to manipulate dye powders without contaminating the air you are breathing. A canopy hood contains fans to exhaust air to the outside, preventing or reducing exposure to fumes. Basic dyes appear to be easy to use (aside from the possibly onerous health protections), can be used for hand-painting, and result in particularly brilliant colors, which are quite washfast on acrylic. However, they dye everything permanantly, including your containers, your sink, your counter, your floor, or anything else they get on to, unlike most other types of dye, and they may be much more hazardous than the other dye classes. They are not for use by the beginner, certainly, and not for use by many expert hand dyers, either. In Australia, Batik Oetoro sells Astrazon basic dyes (similar to Sandocryl® dyes). In the US, you can buy basic dyes as "Alcohol/Water" dyes from Aljo Dyes. Ann Milner's The Ashford Book of Dyeing lists Sennelier Tinfix silk painting dyes as being basic dyes, though it is widely assumed by many dyers that these are acid dyes. Jacquard Products now sells basic dye in one-pound or greater quantities in their Bulk & Specialty Store. The old Jacquard Wood & Reed Dyes were also basic dyes. They wrote, "Wood and Reed Dye is designed for a whole range of dry natural materials: straw, grasses, raffia, leaves, potpourri, shell, bone, dried flowers, bamboo and even acrylic. This dye is strong! It will produce bright, even colors that are water fast to tap water." Methylene Blue and Malachite Green are both sold as medications for sick aquarium fish, but the label will probably fail to indicate how strong the dye solution is. When buying Basic dye, be sure to request a separate MSDS sheet for each dye color! When dyeing acrylic, be aware that it can be damaged by sudden cooling. Allow the acrylic to cool only quite gradually. Another issue is the fact that basic dyes tend to strike the acrylic fiber very suddenly, when the correct temperature (about 60 degrees C., or 140 F.) is reached, which can result in uneven shades. Raise the temperature only gradually between 60 and 70 degrees C. Getting the dye level is a challenge. Commercial dyeing of acrylic uses chemical agents that retard dye striking in order to produce smoother solid colors. Often home dyers very much prefer uneven dyeing, however, and do not find it to be a problem at all. Dissolve the dye in a small amount of hot water, add to dyebath, stir well, add acetic acid, stir well, add the wetted-out fabric. In summary, use an amount of dye that weighs from 1% to 3% of the weight of the acrylic to be dyed, plus 2.5 ml of 30% acetic acid per liter of water (equivalent to 27.5 ml of 5% strength distilled white vinegar), plus at least 2 gallons of water per pound of acrylic fiber; the dye and acid are dissolved in cold water, in a non-food-use cooking pot, and the acrylic fiber is added to the cold dyebath before bringing it to a boil. The acrylic is then boiled in the dyebath for an hour, before allowing the dyebath to cool off, preferably overnight. 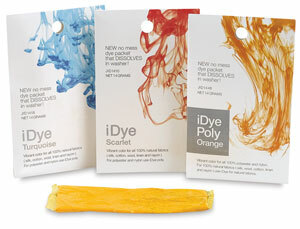 Dyes.co.uk gives more detailed instructions on immersion dyeing with basic dyes. Clariant gave more information for industrial use of basic dyes. The main reason why I recommend against the home use of basic dyes is their toxicity. The fact that basic dyes are positively charged means that they are attracted by the proteins and nucleic acids in our cells. They penetrate inside our bodies much more easily than fiber reactive dyes do, since fiber reactive dyes tend to react with the outer layer of dead cells on our skin, without penetrating inside living cells. The fact that basic dyes penetrate readily inside human cells makes it easier for them to have toxic or carcinogenic effects, even in smaller quantities. Basic dyes should not be used in a kitchen, in case some of the dye powder falls on a food preparation area, and the cooking pot used for heating the dyebath must NEVER be used for food again. THIS IS IMPORTANT! Basic dye is much more dangerous than the dyes we more commonly use for hand dyeing, and must be treated with correspondingly greater respect! Another major problem with basic dyes is that they dye everything. If you spill a little bit of Procion MX dye on your countertop, it may not be the smartest thing you ever did, but you can usually wash it off, with a bit of help from some chlorine-containing scouring powder at worst. If you spill basic dye, the color is apt to be permanent. DO NOT allow any of the dye powder to fall on the floor, counters, tables, etc. Clean up all spills immediately as mandated in the specific instructions in the MSDS. DO NOT breathe any of the dye powder! Wear substantial waterproof gloves, not the thin latex gloves commonly worn when working with safer dyes, and DO NOT allow your gloves to get a hole in them. According to Textile Chemicals: Environmental Data and Facts, a 2004 book by Katia Lacasse and Werner Baumann, dyes that have been have been classified as toxic by ETAD, the Ecological and Toxicological Association of Dyes and Organic Pigment Manufacturers, include basic blue 3, basic blue 7, basic blue 81, basic red 12, basic violet 16, and basic yellow 21. Some of these dyes are in common use. Occasionally, people develop contact allergies to dyes in clothing. Both basic dyes and disperse dyes are less tightly bound to clothing fibers than are fiber reactive dyes, and are therefore much more likely to cause allergies, as loose dye molecules are more likely to contact the skin. One basic dye, basic red 46, is among the more common dye allergies seen in humans; it can be found not only in red clothing, but also in clothing that is dark in color, particularly black or brown. Basic dyes and disperse dyes in clothing are more allergenic than dyes that are bound more tightly to the clothing fiber. In contrast to basic dyes and disperse dyes, allergies to fiber reactive dyes in clothing are almost unknown; the only case published involved clothing that had not had unattached dye washed out properly, although there have been many cases of allergies to the powdered form of fiber reactive dyes among textile workers. Many MSDS (Materials Safety Data Sheets) say that the product has not been thoroughly tested, so information is not available about particular hazards. The absence of a known hazard in the MSDS is not proof that the substance is not carcinogenic or mutagenic. Be careful. Health Hazards Acute & Chronic: may be harmful if inhaled, swallowed or absorbed through skin. May be irritating on contact w/skin, eyes or mucous membranes. May cause cancer based on animal data. Tests on lab animals indicate material may cause tumors & produce adverse mutagenic & repro effects cited in RTECS. First Aid: get medical assistance for all cases of overexposure. Skin: wash thoroughly w/soap & water. Eyes:immediately flush thoroughly with water for at least 15 mins. Inhalation: remove to fresh air; give artificial respiration if breathing has stopped. Ingestion:if conscious, drink water & induce vomiting immediately as directed by medical personnel. Never give anything by mouth to an unconscious person. Respiratory Protection: NIOSH/MSHA approved respirator appropriate for exposure of concern. Ventilation: material should be handled/transferred in an approved fume hood or w/adequate ventilation. Protective Gloves: neoprene or equivalent gloves. Eye Protection: ANSI approved chem workers goggles. Work Hygienic Practices: wash thoroughly after handling. Supplemental Health & Safety Information: spill proc:containerize for proper disp as described under disp. Comply w/fed, state & local regs on reporting releases. 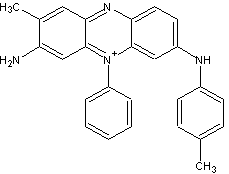 Rhodamine B is a true fluorescent basic dye which is also sold by many suppliers of hand dyes as an acid dye for use on wool and other protein fibers; it has been classified as "Health Rating: 3 - Severe (Cancer Causing)" in the SAF-T-DATA Ratings in a Rhodamine B MSDS provided by JT Baker, though it also says "There is limited evidence that this material causes cancer in laboratory animals. There is no evidence that this material causes cancer in humans." According to an MSDS at Sigma Aldrich, Rhodamine B has been shown to cause tumors and lymphoma, including Hodgkin's disease, when injected subcutaneously into rats, and it has caused DNA damage in the Ames assay and in germ cell lines. MODERATELY TOXIC BY INGESTION. PROLONGED CONTACT MAY CAUSE ALLERGIC REACTION. In my Ph.D. dissertation work, I found evidence that methylene blue intercalates into DNA, giving it a special ability to cause damage. Auramine has been reported to produce chromosomal damage in lab tests & to be mutagenic in the Ames assay. Auramine caused liver tumors in both rats & mice & lymphomas in mice fed diets of 0.1% auramine for approx. 18 months. Health hazards: tested in rat & mouse feeding studies conducted by Natl. Cancer Institute. The material caused liver tumors in mice & thyroid tumors in rats. In summary, there is ample evidence that there is reason to be cautious in the use of some basic dyes. Here is a list of some Basic dyes, with names from a few of the manufacturers, wholesalers, or retailers which sell them. Dye names containing 'Sandocryl' are manufactured by Clariant Sandoz; 'Orcozine' refers to brands manufactured by Orco. 'Acrylene' dyes are sold by Dyes.co.uk, but only to industry. Mauveine, the first of all synthetic dyes, is a basic dye, also known as aniline purple; it was discovered in 1856, but its structure was not certain until 1994. It is a combination of two compounds, mauveine A and mauveine B. It lacks a CI number, as it is of no commercial importance now, but instructions have been published on how to do a small-scale synthesis: Scaccia, R. L., Coughlin, D. and Ball, D. W., (1998). A microscale synthesis of mauve. Journal of Chemical Education, v. 75, p. 769.